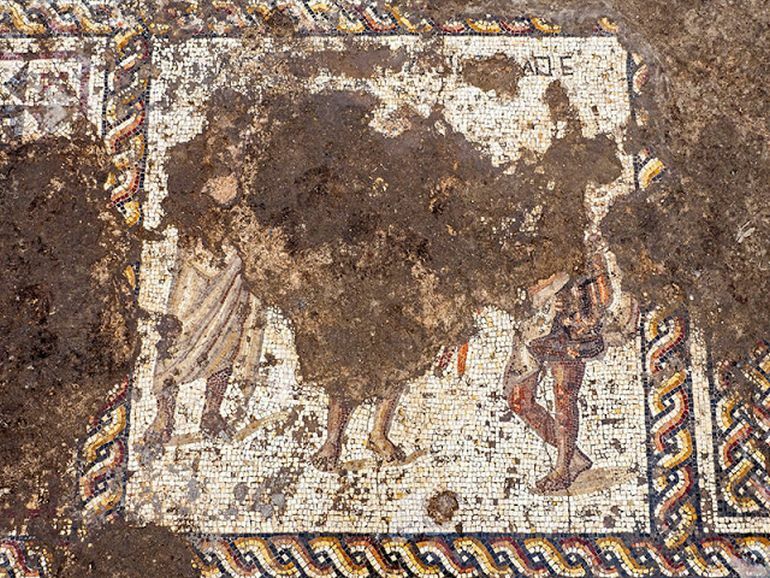 A collaborative effort from Israel Antiquities Authority and the Caesarea Development Corporation has revealed a rare, multicolored Roman mosaic with Greek inscriptions. The excavation was carried out inside the perimeters of the Caesarea National Park that encompasses the ruins of the ancient Judeo-Roman port town of Caesarea (or Kesariya) in north-central Israel. 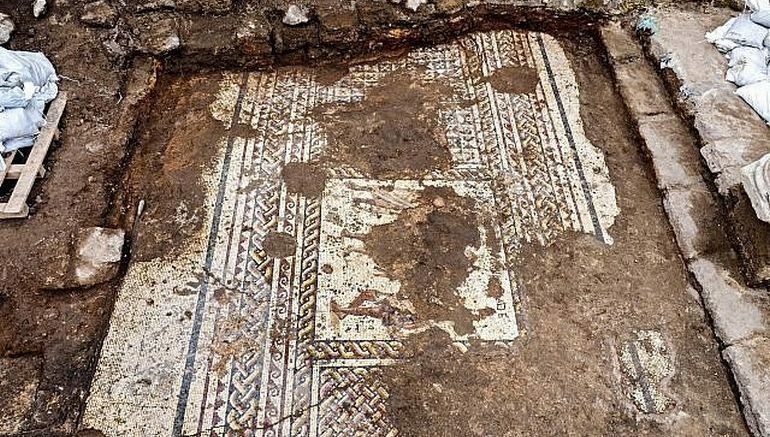 According to the archaeologists involved in the project – which originally focused on the reconstruction of the impressive Crusaders-era entrance bridge to the town, the fascinating mosaic dates back to circa 2nd-3rd century AD and was found underneath the remnants of a larger building. This colorful mosaic, measuring more than 3.5 x 8 m [11.5 ft x 26.2 ft or 302 sq ft], is of a rare high quality. It features three figures, multicolored geometric patterns and a long inscription in Greek, which were damaged by the Byzantine building constructed on top of it. The figures, all males, wear togas and apparently belonged to the upper class. The central figure is frontal and the two other face him on either side. Who are they? That depends on what the building was used for, which is not yet clear. 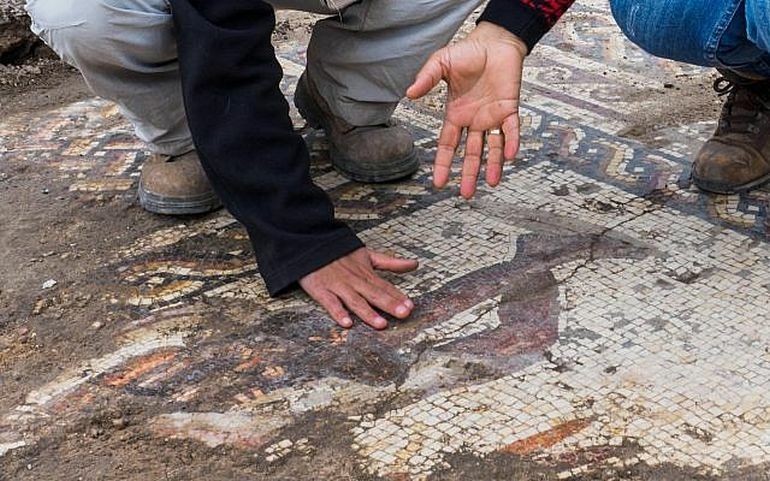 If the mosaic was part of a mansion, the figures may have been the owners. If this was a public building, they might have represented the donors of the mosaic or members of the city council. The assessment of this substantially large mosaic unfolded the exquisite artisanship with the depicted images found to showcase densely placed tesserae of about 12,000 stones per square meter. This impressive artistic level matched the intricate specimens discovered in the vicinity of Antioch, Turkey. And as for the Byzantine building that enclosed this incredible artwork, the researchers have dated it back to circa 5th century AD, which coincides with the early Eastern Roman (Byzantine) period. And judging by its large size, the structure was possibly a part of an agora – the ‘composite’ area that combined commerce and public assemblies. When it comes to the realm of history, the ancient port town of Caesarea was originally built by Herod the Great in honor of Augustus Caesar (circa late 1st century BC). 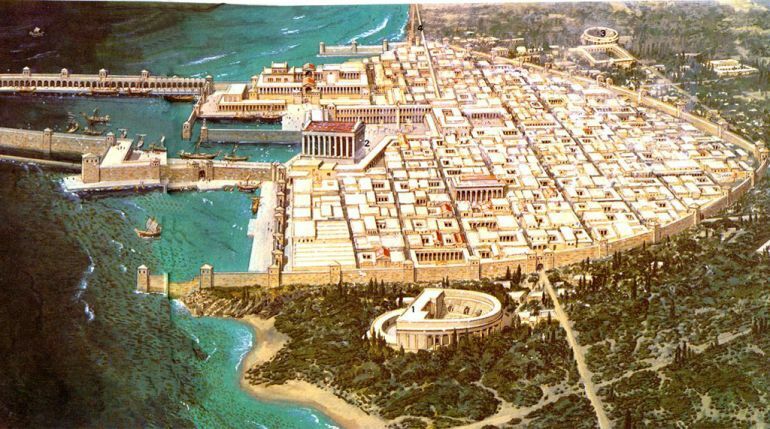 The settlement then subsequently served as the provincial capital of the Judaea Province of the Roman Empire, and as such was an important trading hub (bolstered by farming lands) even after the passing of the Romans, till the Fatimid period. 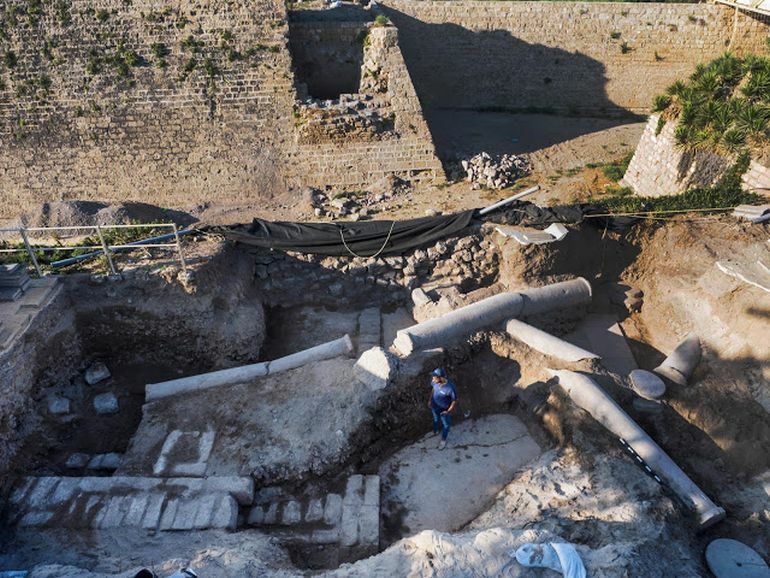 Given this spectrum of historical legacy (especially pertaining to the Romans), back in last year, authorities had already decided to restore the once-imposing ancient Roman temple of the 2,000-year old metropolis, aided by a $27 million project. In collaboration with our colleagues from the Israel Antiquities Authority and the Israel Nature and Parks Authority, we make sure to preserve every find in its natural place and are investing huge resources to make the site accessible to Israeli visitors and tourists from all over the world. Caesarea already provides one of the best and most exciting visitor experiences in the world, and as a result attracts more than 700,000 Israeli and foreign tourists every year. We are proud to note that Caesarea is one of the three most visited sites in Israel. But we have no intention of resting on our laurels. At the same time that we make possible the very intensive archeological work throughout the park, the Caesarea Development Corporation, together with the Israel Nature and Parks Authority, is working to constantly upgrade infrastructure at the site, including the establishment of a spectacular archaeological park, an advanced visitor center, visitor amenities and a delightful promenade that will begin at the ancient aqueduct (Aqueduct Beach) and link up to the promenade along the walls of Caesarea’s Old City. 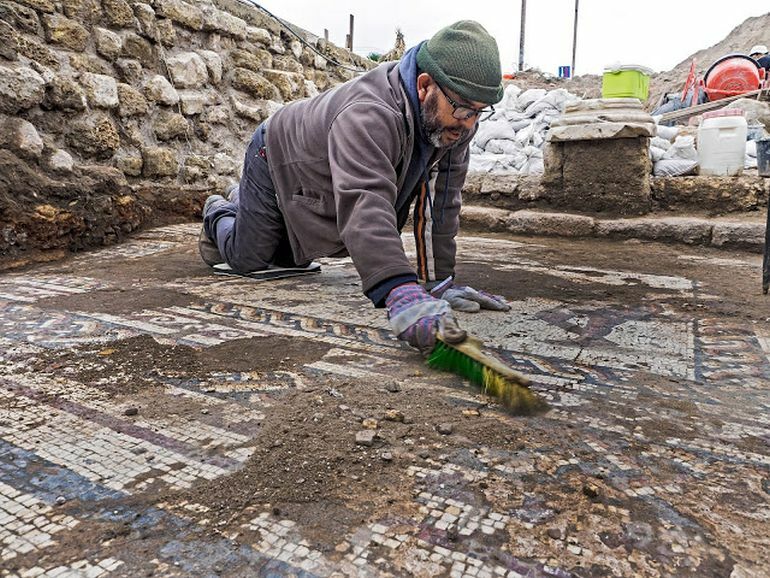 The impressive mosaic joins the many other important recently unearthed archaeological finds. Among these is the altar of the temple built by Herod 2,000 years ago and mentioned by the ancient historian Josephus Flavius; a mother-of-pearl tablet etched with a seven-branched candelabrum, as well as the statue of a ram, which was a symbol of Christian congregation in the Byzantine period.